I'm packing up a few vintage dresses + handmade goods to travel west to San Francisco tomorrow for the Renegade Craft Fair this weekend. I'll be sharing a booth with my pal + confidant Polly Conway, of Pollyannacowgirl Designs, and I couldn't be more giddy. Polly + I have been friends in craft for years + years, and when we get together it's all fun + pure magic. If you're in the Bay Area this weekend, stop by the show + say hello. There will be lots of wonderful shiny things made by over 200 talented makers. 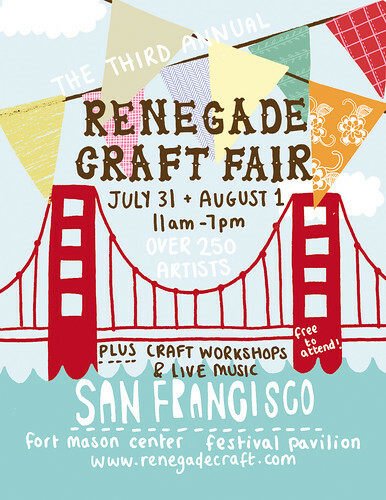 You can find us at the Fort Mason Center Festival Pavilion, July 31st + August 1st from 11am - 7pm. If you need directions, take a peek here + if you'd like more info, there's lots of it here. Super excited!!! Can't wait to see youuu !